It's an old fashioned play that's all dolled up as only the Denver Center Theatre Company can doll up a play. The set (Vicki Smith) is gloriously appointed. The costumes (David Kay Mickelson) are ravishing. The lighting (Don Darnutzer) is superb. They've even added footlights. Old fashioned foot lights! The single location allowed for a beautiful period set design -- it was the kind of set that was so realistic I could vividly picture the other rooms in the home that the actors were exiting into and entering from. Upon entering the expansive Wurtele Thrust Stage, The Amen Corner's audience was presented with a moving and breathing slice of Harlem street life. Scenic designer Vicki Smith structured a three-tiered set anchored in back center stage with a storefront church, complete with long painted-glass windows and a red velvet chair awaiting its pastor. Below the heights of the church sat Pastor Margaret Alexander's minimal kitchen--signaled by linoleum floors and a shiny new Frigidaire. Further downstage, Margaret's son's bedroom featured basic furniture and a record player. Smith ensconced these spaces with Harlem itself. Sidewalks book-ended stages left and right, and each led to a fully developed city streetscape that encircled the entire back wall of the space. In the street behind the church the audience could glimpse liquor stores, billiard halls, and the edges of rundown apartments. These spaces were filled with the life of the community: sailors, grifters, choir members, young girls in pigtails, boys in high-top converse sneakers, church ladies, cops, and drunkards. The beautifully-rendered 1950s Harlem neighborhood set comes alive immediately upon entering the theater, with assorted street characters wandering on and off stage throughout the audience seating. Even these minor characters help to create the realistic feel of the New York City neighborhood dominated by the local church and threatened by the chaos of poverty, crime and human suffering. Even before the actors appear and the lights go down, you know The Amen Corner is going to be something special--scenic designer Vicki Smith's set sees to that. Three scenes cohabitate the Guthrie Theater's Wurtele Thrust stage in this Penumbra Theatre production, which opened Friday night: a well-loved, worn-down Baptist church sanctuary; a church-basement apartment situated a few steps below the church; and, bookending this central scene, Harlem's rough city streets. Smith's set goes beyond creating a lifelike setting in which the action can take place. This is a world alive with purpose, embracing rather than shying away from its calling to unite and strengthen the people interacting with it. It is the physical representation of Sister Margaret Alexander's spiritual mission--and playwright James Baldwin's lifelong crusade to make people rethink their beliefs and priorities. Director Lou Bellamy and set designer Vicki Smith create a vivid sense of Sister Margaret's fundamentalist fastness amid the mad swirl of 1950s Harlem. We see, just barely, a billiards parlor, a liquor store. Kids play, drunks stagger, sailors ogle girls. But the church is a sweet sanctuary of gospel music -- unless you are paraplegic this play will get your feet tapping -- and joyful Lord-praising. It's not usually a good thing when I attend a play and start to examine the set or look at the colors of the light gels. It usually means that the story and the actors have not succeeded in keeping me engrossed in the production. Sometimes, however, the set is another character in the play, and it seems appropriate to study it in the same ways you may notice how an actor moves.Such was the case when I attended the Penumbra Theatre's The Amen Corner at the Guthrie Theater last season. It is a trademark of Lou Bellamy and Penumbra that their sets reflect the gritty realism of the raw, natural acting style you see onstage. My rush line seat placed me in the front row where it was easy to see the details of the neighborhood surrounding the church and apartment. Quack grass grew out of the cracks of set designer Vicki Smith's sidewalks. The building facades were soot covered, as though echoing the tired, worn-out characters in the play. The dirty window shades suggested a lack of caring in these people's lives. It was a stark contrast to the immaculate white costume of Sister Margaret Alexander (realized onstage brilliantly by Greta Oglesby). The congregation of the Harlem church were always dressed to impress. These people have control over this part of their world. However, the disintegrating buildings around them (most likely owned by absentee landlords) reflect a different status of their lives. The characters' physical facades are flawless but their interior lives are crumbling just like the physical world around them. A huge kudos goes to Vicki Smith for creating an unbelievably realistic set. The neglected office building looks like it has been in that spot for decades. You can see telephone wires and old homes in the distance behind it. The aged pipes and peeling paint all add to the exceptional design. No stranger to Wilson's work, Bellamy does a wonderful job of bringing out all the delicate comedy woven into this drama, and he uses Vicki Smith's magnificent set -- a decaying office space surrounded by the squalor of abandoned businesses, boarded up windows and ghetto graffiti -- to full dramatic advantage. Scenic designer Vicki Smith outdid herself with this one. The set has a marvelous maritime feel that surrounds the primary setting of a house in the South of England in 1916. At times I felt like I was on a ship -- from the gorgeous masthead that stood prominently onstage to the vintage maps hanging on every corner. Another aspect that I found interesting and engaging was how people and set pieces kept popping up from underneath the stage and the intricate details of the set pieces. Set designer Vicki Smith outdid herself with a stunning two tier set and large props to enhance and add depth to the Victorian era stage. -Michael Mulhern, broadwayworld.com, December 16, 2011. In director Bruce K. Sevy's production, running at the Denver Center Theatre Company's Stage Theatre, we are treated in Richard Hellesen's adaptation to a stunning series of images of Victorian England, as only the great writer was willing to describe it, in all its inequities and pleasures. 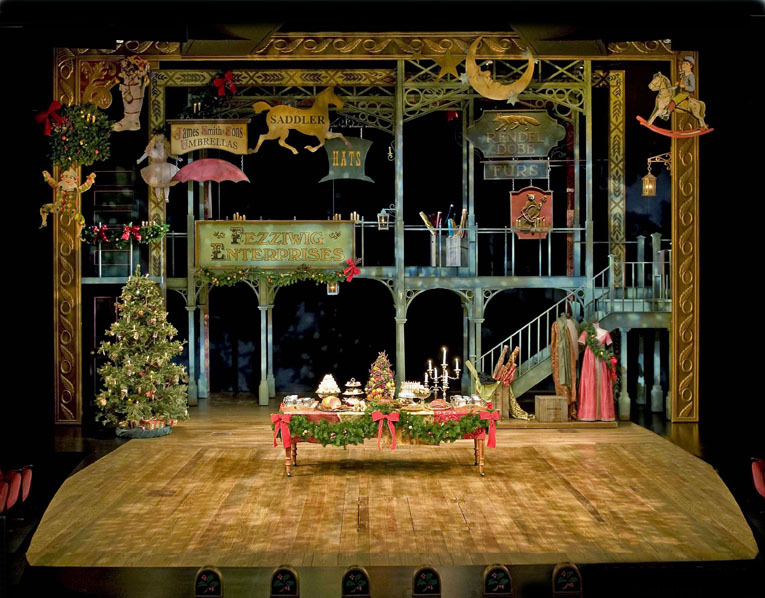 Sevy, scenic designer Vicki Smith and choreographer Christine Rowan keep a constant flow of characters and settings whirling across the stage, tapping into a dream state that ultimately transforms Scrooge's hardened avarice and locked-down heart into the spirit of Christmas. Mix this visual fluidity with David de Berry's evocative and rich score and an astounding and lavish parade of costumes by Kevin Copenhaver, and you have -- a classic. Lou Bellamy's artful, insightful direction; the gorgeous, true-to-date set design by Vicki Smith; and the intensely passionate acting immortalize the message of Two Trains Running, plucking it from 1969 and transplanting it into today: It's never too late to fight for what is right, and it's never too late to make a change. By the time Tamar is caught up in a feud between warring cousins vying for the crown of another kingdom, the pace begins to feel breathless. It's an easy sensation to move beyond, though, primarily because by this point lighting designer Rebecca Fuller Jensen is doing virtuosic work on Vicki Smith's scenic design: Location after location appears, each gorgeous, most evoked on the fly with curtains, cloth, hangings and swaths of light. The Arizona Theatre Company, whose shows are seen in Phoenix and Tucson, is currently doing "Ma Rainey" as well as I can imagine it being done. The staging is by Lou Bellamy, the artistic director of St. Paul's Penumbra Theatre Company, whose magnificent Off-Broadway revival of Wilson's "Two Trains Running" was one of the highlights of the 2006-07 season. Like that well-remembered production, it is earthily direct, wholly to the point and impeccably cast, with Jevetta Steele hitting the center of the bull's-eye as the bisexual blues shouter whose sidemen are at murderous odds with one another. Vicki Smith's three-level recording-studio set is a model of smell-the-coffee realism. This "Ma Rainey" would look great on a New York stage. Barring that unlikely eventuality, you can still catch it in Phoenix (it's already played in Tucson) or in Minneapolis, where it will transfer to the Guthrie Theater in February. No matter where you live, I suggest a road trip. The set, by scenic designer Vicki Smith, is a drab and defunct-looking recording studio, complete with hissing radiators and an elevated booth where Rainey's manager and producer are kept, high above the performers. They look down on Rainey and her musicians, standing as far away as they can get, giving them orders from behind glass. In this way, the setting works nicely as symbolism--the white producer and manager want what Rainey and her musicians can give them artistically, but they keep their distance from them in every other respect. At one point Rainey declares that white men can hear her bluesy tunes come out, but they don't know how the music got there. Sevy's design team infuses the storytelling with a rhythmic fluidity, from Gregg Coffin's acoustic Tejano guitar accents to Vicki Smith's evocative set. A see-through scrim that substitutes for the wall dividing the house from the outside allows the vastness of the everpresent desert to seep into our consciousness. And just when you think the visual palette might be getting tired, Smith unveils a major surprise.'' We finish with an unexpected visual flourish that should take your breath way -- provided you haven't before seen "Sunday in the Park with George" or "Mary Poppins". Technically, this show is dazzling. The set design by Vicki Smith transports you to the desert instantly with stunning use of scrim and lighting effects. The set is minimal and bleak, much like the desert itself, and the true design comes alive with the lighting -- again much like the desert itself. Vicki Smith and Don Darnutzer (lighting design) have truly outdone themselves with a design that supports the message of the story beautifully. The desert itself is an important character, alternately a place of truth and inspiration and a thirsty, desiccated wasteland. Thanks to Vicki Smith's lyrical set design and Don Darnutzer's lighting, at times the home and the desert become almost one, the walls seeming to dissolve in sky, scrub or sand, and so it makes sense that the play's resolution should be communicated in a series of vibrant, startling images rather than anything verbal. Director Mark Cuddy pulls off a spectacular win here. Cuddy and his artistic staff leverage the intimate Rep stage and use almost no sets -- just those objects that are essential to achieve greater drama and interest from the story. One of the very few objects on stage is a large Japanese maple tree that sits outside Morrie's window. Through lighting, the tree changes color as summer transitions into fall and Morrie's health takes its final declines. Particular kudos to scenic designer Vicki Smith and lighting designer Don Darnutzer. But it's soon apparent that smart, meticulous decisions have been made about how best to convey every piece of this story so as to be true to a colorful swath of characters and interrelated stories, while keeping things manageable for the audience. Like a river, it flows when it needs to flow, and like a breeze, it breathes when it needs to breathe. Vicki Smith's deceptively sparse and ever-shifting set plays an integral part in maintaining the staging's remarkable flow, with pieces constantly shifting, sliding, rising and lowering. Schmiedl has kept much of the novel's language, which remains a constant, steady pulse beneath the work, and the direction of Kent Thompson, who commissioned this piece for the Denver Center Theatre Company, is respectful and restrained. Gary Grundei's music, primarily violin and piano, provides a sense of muted yearning, and set designer Vicki Smith's sweeping blue sky dominates the action. On an almost bare stage onto which set pieces rise through trap doors as required, then vanish again, the actors seem small and their work devoid of ego. The cast of characters is not unlike any you have seen or heard before. But this story rings with the truth of life that one might find anywhere out on the eastern plans. There is a trailer-trash family whose son, though noted for his basketball skills, is a bully at heart. There is the school secretary looking for love. There is the local principal wishing for a simpler life. And there is the elderly woman who lives alone and who befriends the two boys whose mother has left them. All of this fills the stage at the Denver Center's Stage Theater. And what a stage it is. Thanks to the amazing work of Scenic Designer, Vicki Smith, characters and staging appear and disappear before you in the blink of an eye through the stage floor. One moment you are watching Tom Guthrie and the McPheron brothers check cattle to see if they are carrying calves, while at the next moment you are looking at the cozy kitchen of the McPheron brothers. Ms. Smith uses limited space to create the complexity of each scene with flawless motion. Echoing the liturgical genre from which its title is partially derived, "Plainsong" expresses its reverence for everyday joys and trials in a steady, unrushed manner. It is a paean to the strength of a place and the people who live there, in this case Holt, Colo. -- a mythical everytown reflective of the small communities spread across the oceanic heartland of the U.S.
Helmed by Denver Center Theater Company artistic director Kent Thompson, "Plainsong" is a robust slice-of-life epic structured as a classic three-act drama, with a fertile narrative and earthy characters whose perseverance echoes in the audience's emotions and imaginations. Scribe and helmer preserve the narrative scope and emotional arc of the novel by effectively mixing Vicki Smith's cinematic backdrops and gem-like settings (brought to life by Don Darnutzer's lighting) with shared monologues by the ensemble. These bridge the action, building on characters and sub-plots economically introduced in the staccato first act. The design elements were as beautiful and harmonious as the music was, each working perfectly with the other and evoking the time and place very well. Vicki Smith's set was created of wood beams and corrugated metal, suggesting a small-town meeting hall, with the addition of two large framed screens, on which the slides (designed by Randal Myler) were projected. Vicki M. Smith has designed a realistic and richly detailed car service setting which features a plate-glassed storefront and a portion of the exterior street. That exterior street is used to good effect. Smith's has captured the spirit of the seventies down to a period pop machine. The lighting as it changes the set over eight scenes, charges the necessarily drab interior with vitality. Set in Pittsburgh in May, 1969, Two Trains Running takes place in Memphis Lee's restaurant. The years of being a successful, vibrant business are over and Memphis' joint, along with the rest of the neighborhood, is slated to be torn down for "urban renewal." The few remaining steady customers still drift in to eat, run numbers, philosophize or just hang out. Vicki Smith's wonderfully realistic set puts us right in one of Memphis Lee's booths, where we, too, can sit and look out the window onto Wylie street and watch the world go by. Nagle Jackson is an intensely visual director. For the Denver Center Theatre Company's The Misanthrope, he utilized the talents of set designer Vicki Smith, lighting designer Peter Maradudin and costumer Andrew V. Yelusich, and the production is flat-out gorgeous. The set is simple and elegant: white alternating with panels of a muted burnt orange; little flying cupids, one holding a candelabra; and, from the second scene on, a great round bed, center stage, trimmed with cloth roses and swags of white fabric. The Denver Center Theatre's production values for Pierre are stunning. 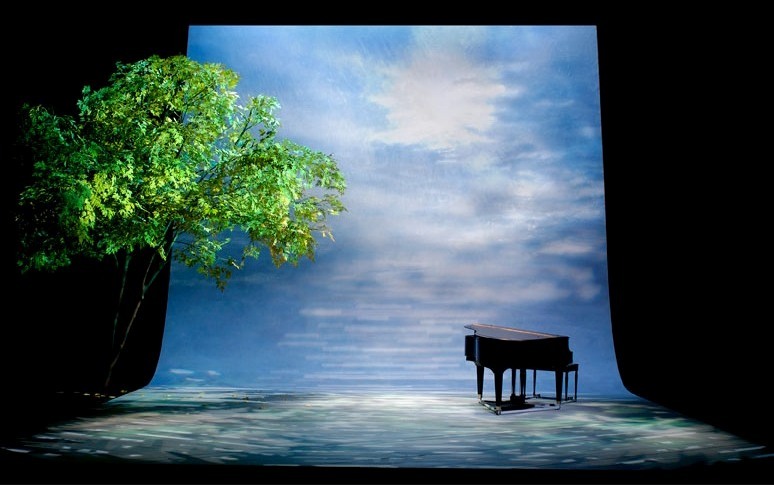 Vicki Smith's set design is elegant and expressive; Pierre would be worth attending just to watch the play of Don Darnutzer's gorgeous lighting against the scrim.